French + Italian is a women’s clothing and accessory shop based in Marblehead, Massachusetts that gets its inspiration for its elegant and classy designs from both French and Italian clothing. Here, you can shop from a variety of clothing options, including tops and dresses, and plenty of accessories, including shoes, bags, and jewelry. With Big Apple Buddy’s personal shopping service, you can now buy direct from the French + Italian online store anytime, anywhere. Shop from a number of stylish looks at French + Italian, including this Vanessa Bruno Cyclades Black Dress. This sleeveless black dress with a sleek v-neck cut is a simple and classic look that can be worn a number of ways. The synch waistline allows you to either wear the dress loose or tighten the strings so it clings to your waist. Dress it up or make it casual: this versatile dress will get plenty of use in your closet! This shop also offers several different styles of shoes, with options for both warm and cool weather. 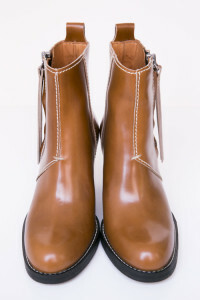 Acne Studios’ Pistol Chestnut Boot is a short, leather ankle boot with a low stacked heel and round toe. Made of 100% leather, this shoe will protect your feet in cooler weather and keep you looking cool and stylish at the same time. Tote around your belongings in this elegant Renard Bijoux Brown Leather Crossbody Bag. 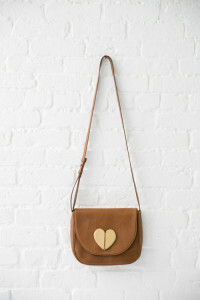 This soft leather bag comes with an adjustable strap for your comfort, and the light tan wooden heart design on the front of the bag is sure to make it stand out from the rest of the bags in your closet. With one side pocket and a large inside compartment, there is plenty of room for all of your necessary belongings inside this purse. And since it’s made of 100% leather, you can be sure that this bag will last you a lifetime. Unfortunately, the USA French + Italian online store does not currently offer international shipping. However, Big Apple Buddy, your personal shopper, can help you buy products direct from the official USA French + Italian online store and ship them to your doorstep, no matter where you are in the world. We offer international shipping to over 220 countries including Australia, South Africa, the UK, Germany, Portugal, France, Italy, Pakistan, Switzerland, Slovenia, Slovakia, Spain, Singapore, Thailand, Malta, Brunei, the UAE, Indonesia, Malaysia, Philippines, Macau, Croatia, Estonia, New Zealand, Hong Kong, Kuwait, Kenya, Canada, Japan, South Korea, Oman, Austria, Chile, Lithuania, Latvia, Sri Lanka, Norway and Taiwan. If you would like to buy from the USA French + Italian online store, simply let us know which items you would like to order (by filling out the form on the right) and we’ll get back to you with a free international shipping quote within 24 hours!